There's three flavors to choose from and you can order them as a shake or in a waffle cone. There is OREO & Cake, Strawberry Shortcake, and Vanilla Birthday Cake. Of course I went the shake route and of course I went with their Oreo variety because Oreos. Upon arrival, I could tell this was going to be a sweet shake. And boy was I right. Before talking about the flavor, I just have to give Sonic some credit. They made this shake look very appealing. Oreo bits everywhere is always a plus. Now to the sweetness... 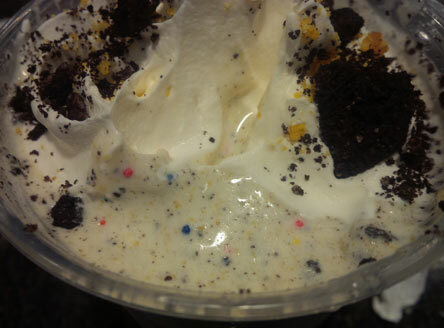 Okay, so the shake does taste like cake, funfetti to be exact. There's tons of little round sprinkles throughout that add a bit of a crunch and more sweetness to the mix. Right now, it tastes like I'm drinking funfetti batter. Okay, I lied. I couldn't actually drink this one. It was far too thick, so I ate it with a spoon. 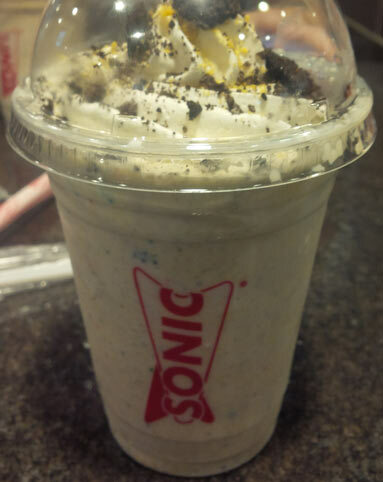 The saving grace of this shake is the Oreo cookies. The bitterness from the cocoa works to lessen the sweetness factor. The problem is, there's not even close to enough Oreos to alleviate the sugar coma I was about to go in. 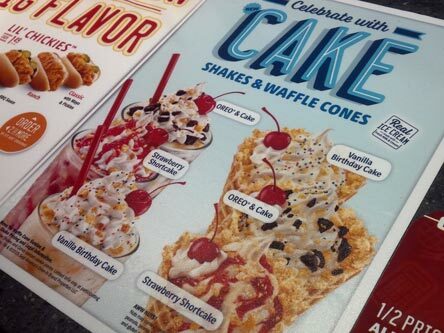 I don't even want to imagine what the Vanilla Birthday Cake shake tastes like. If you have a super sweet tooth, this one's for you. I have a pretty decently sized sweet tooth and I had trouble getting through half of my small shake. Buy Again? Nope, I might give the strawberry one a shot though. A small has 960 calories according to Sonic's website; in comparison, a large cookies & cream milkshake from Chick-fil-A has 660 calories. Well, I certainly believe you when you say this thing is sweet! xD That's crazy! I don't know how Sonic packs so many calories into their milkshakes!! !